Sandeep (right most) receiving the award from Minister Abdul Wahid. Franklin Templeton GSC Asset Management Sdn Bhd (FTGSC), a Malaysian unit of the global fund manager, was named the ‘Most Outstanding Islamic Asset Management Company’ in Malaysia at the Kuala Lumpur Islamic Finance Forum (KLIFF) Awards Dinner Presentation 2014 on Nov 11. 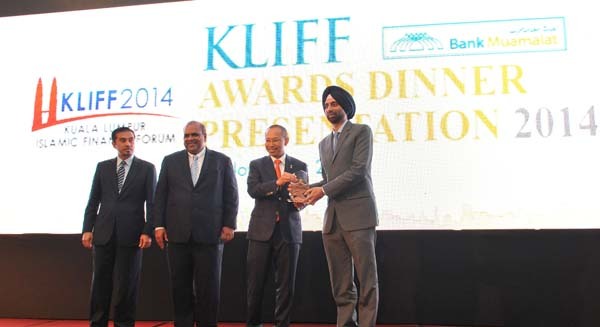 Franklin Templeton Malaysia Country Head Sandeep Singh represented the asset management subsidiary to receive the award presented by Minister in the Prime Minister’s Department Datuk Seri Abdul Wahid Omar. FTGSC is the Islamic asset management entity of Franklin Resources, Inc., a global investment management organisation, according to a statement from the company. FTGSC obtained its Islamic fund management license from the Securities Commission, Malaysia in January 2010. Within four years, Franklin Templeton has grown its global Islamic assets to over USD 1.90 billion (as of 30 June 2014) ranging from managing Shariah global, regional and Malaysian equities, as well as global and local Sukuk, the statement added. Sandeep was featured in Asia Samachar in a Oct 29 posting entitled Two prominent Sikhs at Islamic finance forum in Dubai.